I met Alana Langan, one half of Ivy Muse at DENFAIR in June and it was great to speak to her and Jacqui Vidal again recently about their upcoming Lucid Fields collection, which launches today! Lucid Fields features a range of stoneware, powder coated steel and aluminium pots and planters all designed and made in Melbourne. We had a quick Q&A with Alana and Jacqui about their range, their design process and their advice for plant enthusiasts! MM:What was the inspiration behind Lucid Fields? JV - ‘Lucid Fields’ draws its inspiration from the luminous elegance of plants and their ability to communicate with us as their carers. We wanted to celebrate the natural brilliance of plants in all their glory. 'Lucid Fields' is really about showcasing greenery, celebrating their myriad of benefits and ultimately letting them do their wondrous thing. MM: Do you have a favourite piece in the collection? 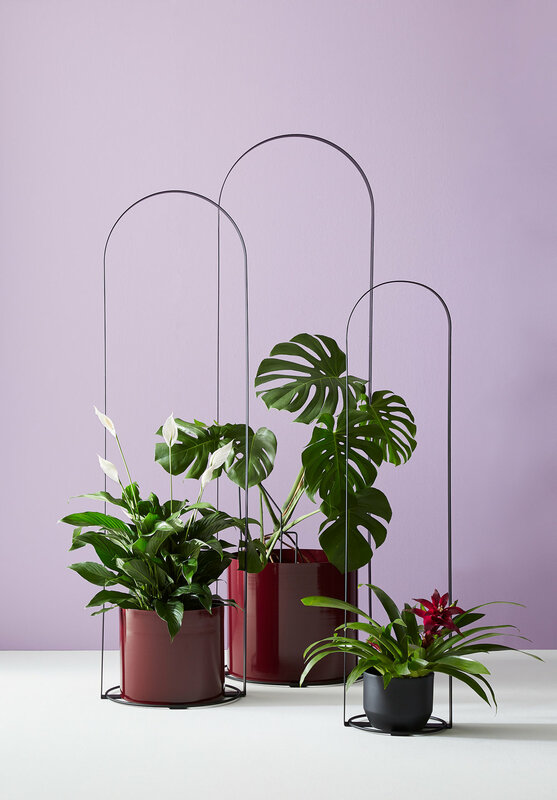 L: I'd have to say the 'Unity' wall planter in the limited edition Claret colour way. It turns plants into works of art. MM: What plant do you recommend for indoors for a beginner? JV: Zanzibar Gem. Also known as the 'plant that thrives on neglect'. Great for people who forget to water; it generally only needs a little once a month. It's a great plant to gift friends for that same reason! MM: What is the design process behind your collection? AL: Jacqui and I often have ideas buzzing around our heads constantly. When we're clear on something we'll sit down and sketch it (we're very low tech!) and from there, pitch it to each other. We're lucky that we work well together; if I have an idea for a product but can't formulate a functional design, Jacqui can pick it up and run with it. And vice versa. We're often tweaking and truly collaborating on designs a number of times, it's a really fun process. MM: How do you decide which plants to pair with what spaces? JV: Firstly we have to establish wha environmental actors we're working with. For instance, what's the orientation of the space (e.g. East, North, etc), how's the temperature, humidity etc? hen we ascertain which plants are suitable from a functional perspective, whilst also considering the look and feel we're working towards. MM: What is the first thing you do in the morning? AL: Get woken up by my two kids! (Then tea and yoga most days). JV: I'm pregnant so coffee isn't on the cards at the moment but I can recommend the Rose Lass at Willow in Armadale! MM: What are you excited for in the future? AL: As well as launching our 'Lucid Field's collection we're working on an exciting project (due to launch early next year) which we can't wait to share. We've also got some brand new pieces to launch in the coming months. It's a busy time but we're lucky to love what we do!